Henry Weekes was born in Canterbury, Kent, the son of Capon Weekes, a bank employee, and his wife Mary Pearson. After an education at the King's School, Canterbury, he was apprenticed to the distinguished sculptor William Behnes in London (1822–7). He entered the Royal Academy Schools in 1823, where he won a silver medal for sculpture in 1826. He became an assistant to the well-known portrait sculptor, Sir Francis Chantrey, in 1827, remaining with him until Chantrey's death in 1841. 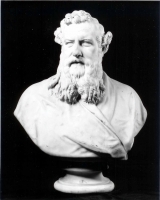 His early commissions were from his home town of Canterbury, and included busts of Stephen Lushington, MP for Canterbury and governor of Madras, and his father-in-law George Harris, Baron Harris of Seringapatam and Mysore for the Canterbury Philosophical Society. This led to a series of Indian commissions including works for St George's Cathedral, Madras. In 1838, he was the first sculptor to execute a bust of Queen Victoria, being commissioned by the queen as a gift for her mother, Princess Victoria of Saxe-Coburg-Saalfeld. His sensitive depiction of the young queen established a reputation for portraiture. An associate of the Royal Academy from 1851, he was elected a Royal Academician in 1863. In 1851, he won a gold medal from the Royal Society of Arts for an essay on the Great Exhibition. He was the academy's professor of sculpture from 1868 until 1876. In his role as professor of sculpture to the Academy, Weekes delivered a series of eighteen lectures which were published posthumously as Lectures on Art, with a biographical introduction by his son, John Ernest Weekes. Art historian Benedict Read described the Lectures as "the most consistent and intelligent exposition of sculptural thinking in the Victorian era"